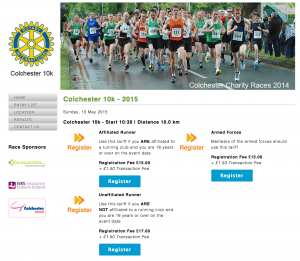 To maintain security, the Colchester 10k race registration is handled by Primo Solutions. Runners who are members of a running club with a UK Athletics affiliation number should use this. You will be asked for details of your club and your registration number. All other runners should register here. You can join an existing team or create a team, or simply enter as an individual within this class. Runners from the Army or other force should use this class of entry and create a team with their Regiment name.